If you’ve been dreaming of a custom hydraulic system, stop. 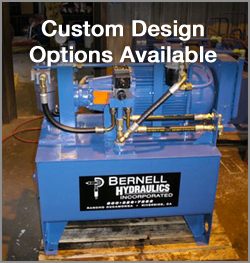 You can make your dreams a reality by contacting Bernell Hydraulics. We have plenty of experience creating custom hydraulic systems in Chino CA and our expert staff will be happy to help you create the perfect custom system for your needs. Custom hydraulic systems in Chino CA can really help your business. However, you have to be sure you’re choosing the right partner to create your new hydraulic system. When you choose Bernell Hydraulics, you will receive expert assistance at every stage of the process, from design to parts selection and construction. We can use plans provided by your engineers, or help you create detailed plans in our office. We will then machine all the necessary parts and put them together to create a solid, well-built custom machine that should serve you well for years to come. If you work with custom hydraulic systems in Chino CA, you know that custom systems have their own quirks. Because you may have custom-machined parts in your system, you won’t have the typical manufacturer’s guidelines to fall back on regarding operating conditions and maintenance schedules. Fortunately, when you buy your custom system from us, we can provide you with this information. We can not only advise when service will be needed, but also perform that service for you. We can change fluids, replace hoses, and manufacture new custom parts and fittings as needed. We’ve been in the hydraulics parts and service business since 1977. You can trust us to perform quality work on the expensive hydraulic systems that you depend on for your livelihood. We take pride in our work and provide 24 hour field service to keep your custom systems running.